The Gospel of John, the story of the Word made flesh. 1. 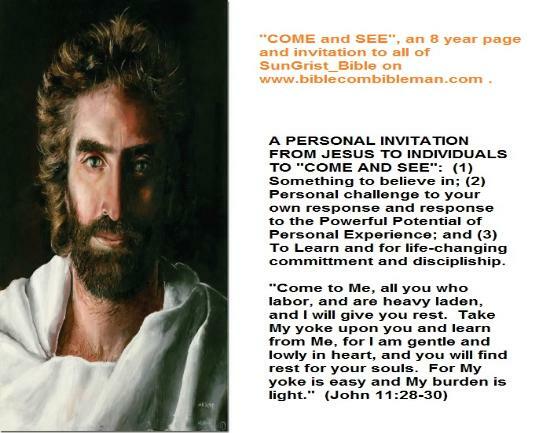 “Come and See”, the Gospel of John. 2. Signs for Believing in Jesus. little epistles of John and Paul. 1. Security of the Believer . 2. Complete Outline of I John. 3. Faith and Faith Contending in the Bible. 4. Some Sounds of a Sound Faith. I. Philosophy of Religion., Rest for Your Minds. not such a wiseacre as to think you have nothing to learn from the past." II. "A Touch of the Eternal, the book of Job"., Rest for Suffering Souls. complete flow through the Bible. THE TOP 12 TOPICS OF THE BIBLE.